A 4 hour walk (9 miles) well away from the crowds, which can be done as two 2¼ hour walks. 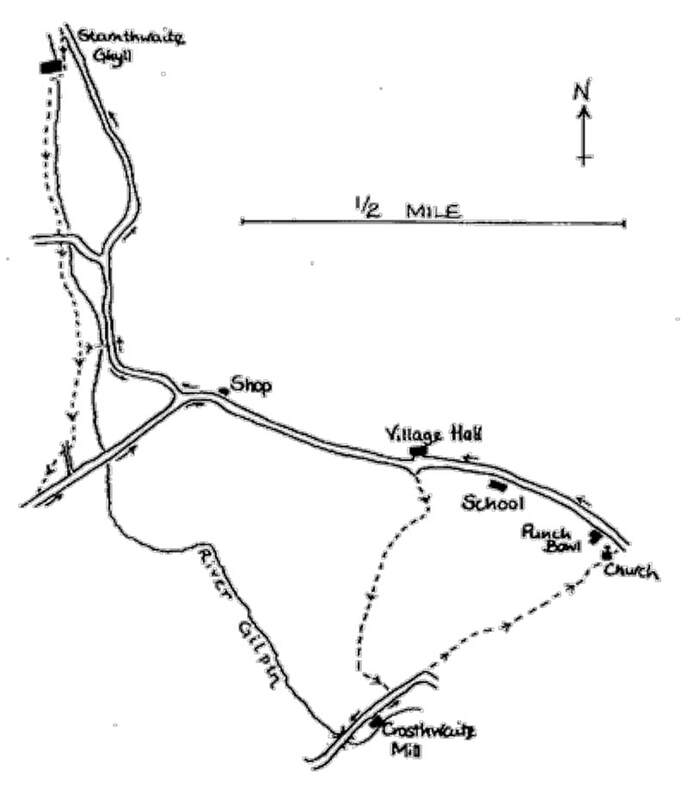 From the Punch Bowl, turn left and walk through the village, past the school and village hall. Turn right, the road signed Starnthwaite and Crook. After the junction with the Hubbersty Head road, keep straight on for about 75 yards. Take a track on the right signed: Footpath, Low Fold. After about 300 yards look for a gate on the left and a yellow arrow on a post. The path is not at first obvious in the field, but bear right and you will see a row of hawthorn trees on the edge of a bank. Keep these on your left. At the end of the row, turn left through a gap in what was once a wall and follow the ill-defined track. Bear right before you reach the small beck and look for a gate with a stile at the junction of a wall and a fence. The path ahead is much more obvious as it winds uphill between gorse bushes. Near the top of the hill you will get good views of the Kent estuary, the end of Whitbarrow and the ridge of Cartmel Fell. As the path levels off, follow the fence on your left through a marshy area. Follow the fence to its end, then over a stile into a field. Bear slightly left and aim for distant trees. Over the brow of the hill, the path becomes more obvious again and leads to a ladder stile and a farm track. Bear right here and then turn left along the track to Low Fold. Continue on the well used track through a gate with a gnarled ash tree as a gatepost and uphill to a gateway after which there are good views of the Lakeland fells. The track ends in a field near a large oak tree underneath which a yellow arrow shows the direction to take across the field, via another yellow arrow, to a ladder stile in the corner. Bear left to cross the next field and join a track alongside the wall. Through the gate, turn left at the road and go over the cattle grid following the drive to Birk Moss. The bridleway has been diverted to avoid the farmyard — follow the blue arrows to the left of the buildings and then bear right. Over the brow of the hill, the path is just visible, continue to a T junction with a low finger post where you turn left on the bridleway to Bulman Strands. Pause to admire the views including Heysham nuclear power station. Continue down this path, turning sharp left through a gate with a blue arrow into a walled lane. After the next gate, follow the blue arrow down the field, go between a sycamore and a short row of hawthorns and then more sharply left to a gateway. Follow the beck on your right down to a wooden gate onto the road. Continue or restart the walk by passing Bulman Strands. Take the bridleway on the left which starts down the drive of Crook Foot but turns right after a bridge over the river. This well used lane leads through an iron gate and towards a group of houses. Turn left at Thornyfields and up the bank, keeping to the right of the barn and then turning left through a gate beside it. The track follows the line of the wall on your left, climbing up steadily. Another gate, then between the gorse bushes to the summit where a kissing gate takes you into an open field but with the path still visible. A pond on the left is worth a few minutes quiet observation for its wildlife interest — moorhens, dragonflies, tadpoles? Views of the Winster valley and the Coniston Fells can be seen as you start to drop down with a tumbling beck on your right. A gate leads you onto the A5074. Cross the road and take the bridleway signed to Bryan House Farm. A wooden gate in the right hand corner of the field leads into a walled lane with a stone footbridge over the beck. Continue up, through a gate, and then down towards the farm with Winster church visible on your right. After the next gate, and about 30 yards before joining a minor road, turn left on the path signed to Lamb Howe. Go through the gate and follow the track to the left of the wood. Continue through another gate under a large wild cherry tree and follow the track as it winds between fallen walls and piles of stones. A post with a yellow arrow directs you between two concrete gateposts. At a junction with another path, follow the sign to Roper Ford. The path almost disappears in the gorse and bracken, but bear right and you should emerge in the corner of the field with a wooden ladder stile on your right and a stone stile on your left. Take the stone stile and follow the wall on your right. Just after the next gateway, climb the ladder stile on the right and continue between the hedge and a tall fence. Another ladder stile leads into an open field — keep left across the field to a metal gate and then another gate leading you down Lamb Howe farm drive (ignore a yellow arrow on a gatepost to the right). 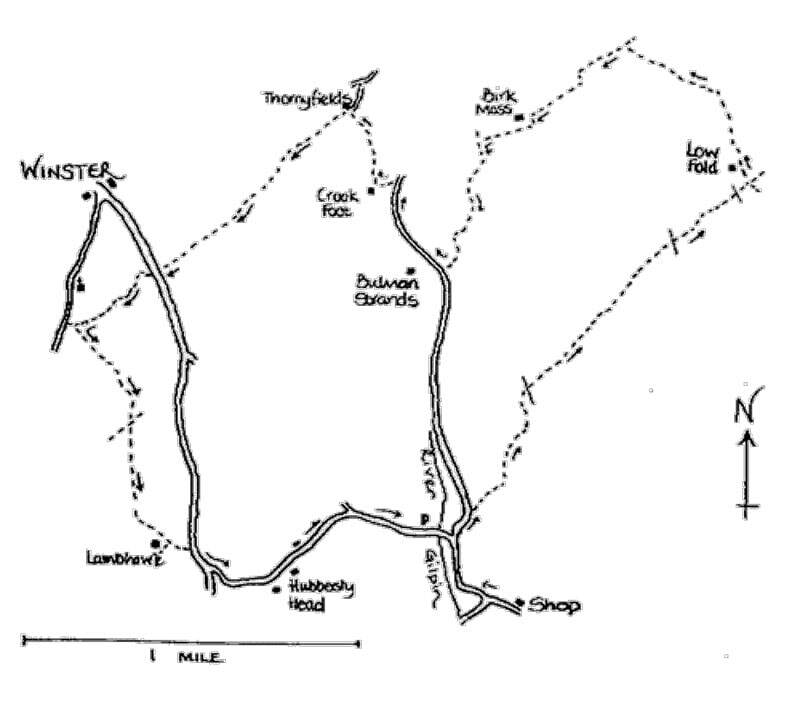 (1¼ miles each) from Crosthwaite. From the Punch Bowl, turn left. Walk through village, past school and village hall. Take the turning signed Crook and Starnthwaite, and follow the same sign at the Y junction. Continue on this minor road to Starnthwaite Ghyll where a bridleway sign on the left takes you down the drive. Continue round the corner of the main building, through the car parking area to the wrought iron gates. The footpath is visible and takes you through 2 small sections of field and onto a track beside the river. Cross the minor road to a stile and continue beside the fence to the next stile, which has two yellow arrows. To return to the village, follow the left-hand arrow to a kissing gate by the river. Cross the footbridge, turn right at the road and retrace your steps to the old shop located by the village phone box. To extend the walk, follow the other arrow. Continue in this same direction over 4 stiles (3 of which have yellow arrows), crossing a tarmac drive. In the next field look up-hill for a post with an arrow directing you to a stile into the road, turn left. (Be careful of the traffic).